Groom and Doom by Theresa Braun is a dark, yet whimsical tale of a woman who meets and marries the man of her dreams only to experience a nightmare. Angela’s engagement and marriage to her Greek groom Stavros should have been a fairytale life. Instead, the reality was fit for a horror movie. As the main character, Angela, discusses her failed attempts at romance prior to Stavros, I quickly got a feel for the author’s easygoing style. Braun placed the story in Angela’s hands, and Angela laid out a tale of family experiences, Greek history, etymology, European landscapes and various understandings of spiritual dogmas. Angela shared her experiences in dealing with archetypal men: the nice guy, the bad boy and the psycho. Then Angela meets Stavros. I’m not sure if he’s tall, but he’s definitely dark and handsome. Reluctant to give in to her almost instant feelings of true love, Angela kept me interested in how things would unfold between the two through marriage and beyond. An upcoming beautiful marriage in Greece is marred by the tragedy of the death of Starvos’ mother, which sets off a domino effect of difficulties for Angela. Being an American woman marrying into a Greek family presents a unique situation, such as language barriers and learning new traditions. These are difficulties that Stavros’ American mother faced in marrying Stavros’ Greek father, so it’s interesting that Angela had to navigate this particular path alone. Angela’s dysfunction is not specific to her in-laws. It is also deeply rooted back to two generations in her own family. Angela’s issues with her mother and her father and their past played a huge part in her outlook on life. This made for some very interesting revelations throughout the novel. What neither Angela nor Stavros are prepared for is the constant set of brick walls thrown up by Angela’s father-in-law, Georgius. Mourning from the recent death of his wife and bitter about the seemingly underachieving life chosen my his youngest son, Stavros, Georgius casts a dark cloud over the whole story. Georgius is sinister, and his wicked ways have an effect on Angela’s mental stability. Since Angela is one of the main characters and narrator, we all suffer through sympathy and empathy. Angela makes every attempt to ponder her best move to gain traction with her in-laws while constantly running into obstacles in terms of gaining their respect. If Stavros is Angela’s knight in shining armor, his chivalry is often overshadowed by his father’s overbearing and antagonistic ways. His obstinate behavior towards Stavros and Angela is relentless. As warm and knowledgeable as Stavros is, he is the exact opposite to his father’s frigidity and distance. This makes for some extremely interesting incidents for the soon-to-be newlyweds. Groom and Doom is not for action seekers or the thrill enthusiasts. This is the type of story for the laid back reader who likes to take time with the long sweeps of the author’s storytelling brush. Theresa Braun allows this story to slowly simmer Iike a meal prepared in a Crock-Pot®. The easiness of Angela’s relationship with Stavros is jutted against the stark reality of Angela’s loathing for the bottomless pit that is her job as an English professor. The third word in this book’s title foreshadows Angela’s apparent angst about her beautifully tragic love life. From her intuition to her experience with clairvoyants and psychics to outside factors, Angela subtly indicates through her internal dialogue that something not-so-good is on the horizon. It’s the proverbial trouble in paradise. There is logic, and there is metaphysics. There is the concrete, and there is the abstract. Groom and Doom deals with all of those equally. Angela makes sense of her brooding frame of mind by taking inventory of her past, present and future by using her five physical senses and the sixth sense. She supplements her personal knowledge with the help of tarot card readers. It is hard for Angela to process all of the conflicting information from her various sources. Family dysfunctions and inaccurate readings have as much relevance as the harmonious experiences and the divine truths. The star-rating for this book would have been higher had Groom and Doom not moved so agonizingly slow. Moving from courtship to engagement to the Greek wedding to the thereafter, there are too many details. With Angela at the helm of Groom and Doom as the narrator, the minutiae of how she perceives her internal and external struggles made the story stall in several places. The counterbalance to the idle moments in Groom and Doom is the wealth of information expounded on by Stavros. His jokes, his timing, his knowledge of Greek history, his curiosity about the places he and Angela travels all make for a rich experience for the discerning reader. I did not feel Starvos’ presence in Groom and Doom was strong enough to make up for the pacing of this novel. Theresa Braun wrote Angela in a way that made Angela down-to-earth and flawed. If you like the action more than the build up, Groom and Doom may be a frustrating novel to tackle. 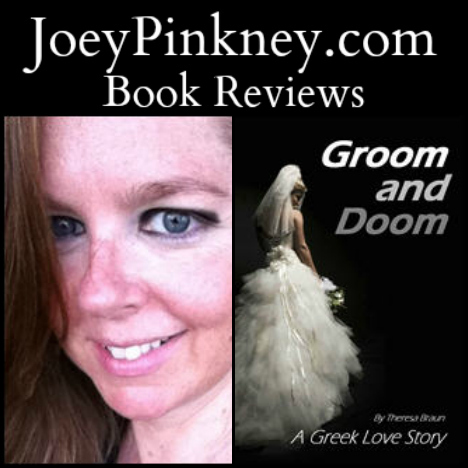 If you would love to travel through the Mediterranean, especially Greece, but can not make it for whatever reason, Groom and Doom is worth checking out.